The number of extra deaths in England and Wales last winter was the highest since 1999/2000, figures show. Statisticians looked at the number of deaths between December and March, and compared them to those which occur during the rest of the year. The Office for National Statistics calculated there were 36,700 "excess" deaths during the period - an increase of 49% on the previous year. The greatest number of excess deaths occurred in people aged over 85. Among this group, deaths were higher among women - although this is in part due to the fact that more women survive past the age of 85. In total there were 21,400 excess winter deaths among females, and 15,300 among males. Excess deaths were significantly higher in 2008/09 than in the previous two winters for all regions, except the north-east of England. The number of deaths in Wales jumped by about 70% from 1,440 in 2007/08 to 2,500 in 2008/09. Deaths in the winter are consistently higher than at other times of the year. Lower temperatures raise the risk of hypothermia, and allow diseases such as flu to thrive. As a result the number of deaths from respiratory disease tends to rise sharply. Deaths from cardiovascular disease also peak. According to the Health Protection Agency, flu activity started early last winter, and more cases were recorded than in the preceding winters. The winter of 2008/9 also had the coldest average winter temperature since 2005/6. Andrew Harrop, of Age Concern and Help the Aged, said: "It is a national scandal that the UK has more older people dying in winter, compared to the rest of the year, than countries with more severe weather, such as Sweden and Finland. "Excess winter deaths of older people have remained stubbornly high in recent years, but last winter's huge spike sounds a deafening wake-up call about the older population's well-being if we have another cold snap." 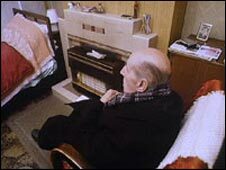 Mr Harrop said rising energy bills forced 40% of older people to cut back on heating last winter to save money. He called on the government to do more to tackle fuel poverty. Greg Clark, the shadow energy secretary, said fuel bills were at record levels. He said: "Pensioner households are clearly among the most vulnerable during the winter months, so it is disturbing that they are also the most likely to be struggling to afford to heat their homes adequately." A Department of Health spokesperson said the government was working to increase uptake of grants to improve heating systems and insulation and benefits for those whose health was most likely to be affected by cold weather. Advice on how to stay fit and healthy through the winter was also available through the "Keep Warm, Keep Well" campaign. Figures published by the General Register Office for Scotland last month estimate that there were 3,510 excess winter deaths in Scotland in 2008/09, up by 1,330 on the previous winter.